Home News Great! 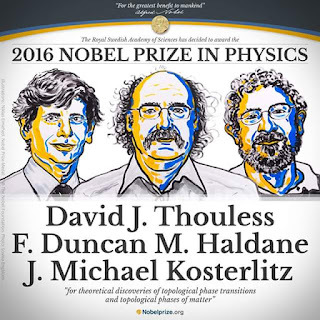 David Thouless, Duncan Haldane and Michael Kosterlitz hits Nobel Prize Award of 8 million Swedish krona! Great! 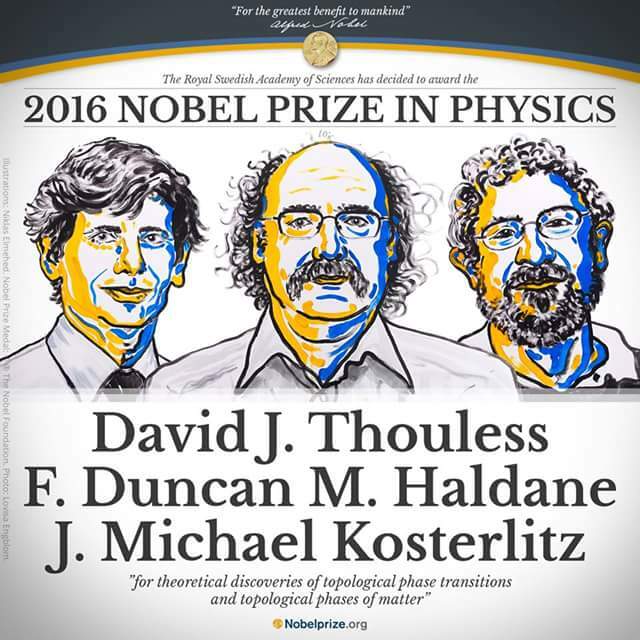 David Thouless, Duncan Haldane and Michael Kosterlitz hits Nobel Prize Award of 8 million Swedish krona! The Nobel Prize Award of 2016 was announced on Tuesday the 5th of October, 2016 with David Thouless, Duncan Haldane and Michael Kosterlitz splitting the ultimate prize of 8 million Swedish krona among selves. They won it ”for theoretical discoveries of topological phase transitions and topological phases of matter”. They revealed the secrets of exotic matter, according to the Royal Swedish Academy of Sciences . "The 2016 Physics Laureates opened the door on an unknown world where matter can assume strange states. They have used advanced mathematical methods to study unusual phases, or states, of matter, such as superconductors, superfluid or thin magnetic films." Because of this " the hunt is now on for new and exotic phases of matter. Many people are hopeful of future applications in both materials science and electronics." "Kosterlitz and Thouless have studied phenomena that arise in a flat world – on surfaces or inside extremely thin layers that can be considered two-dimensional, compared to the three dimensions (length, width and height) with which reality is usually described. Haldane has also studied matter that forms threads so thin they can be considered one-dimensional." "Their discoveries have brought about breakthroughs in the theoretical understanding of matter’s mysteries and created new perspectives on the development of innovative materials." David J. Thouless is from the University of Washington, Seattle, WA, USA; F. Duncan M. Haldane is from Princeton University, NJ, USA; while J. Michael Kosterlitz is from Brown University, Providence, RI, USA. "The three Laureates’ use of topological concepts in physics was decisive for their discoveries. Topology is a branch of mathematics that describes properties that only change step-wise. Using topology as a tool, they were able to astound the experts."